I opened the fridge to see what we had. 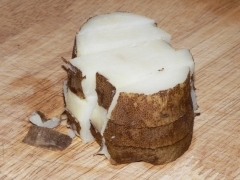 Hmm, half a baked potato left over from last night’s dinner. 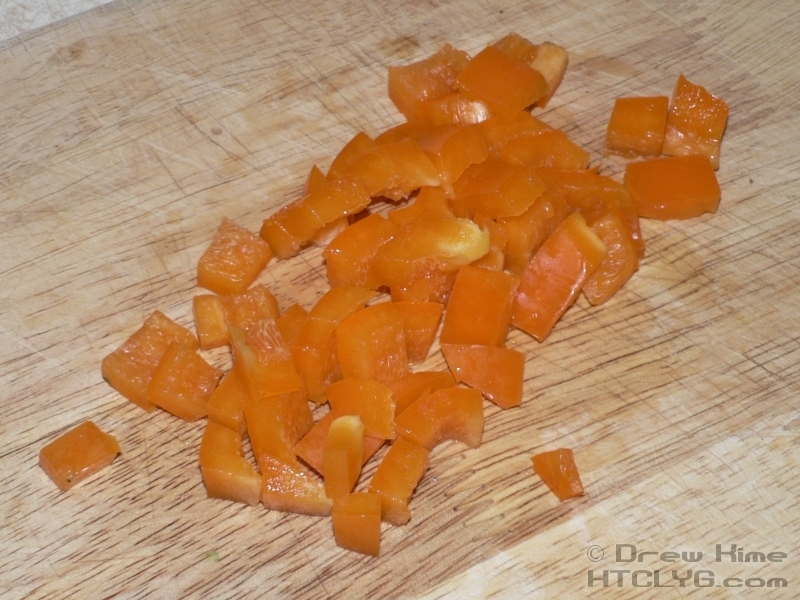 Sweet onion and orange bell pepper from the salad. 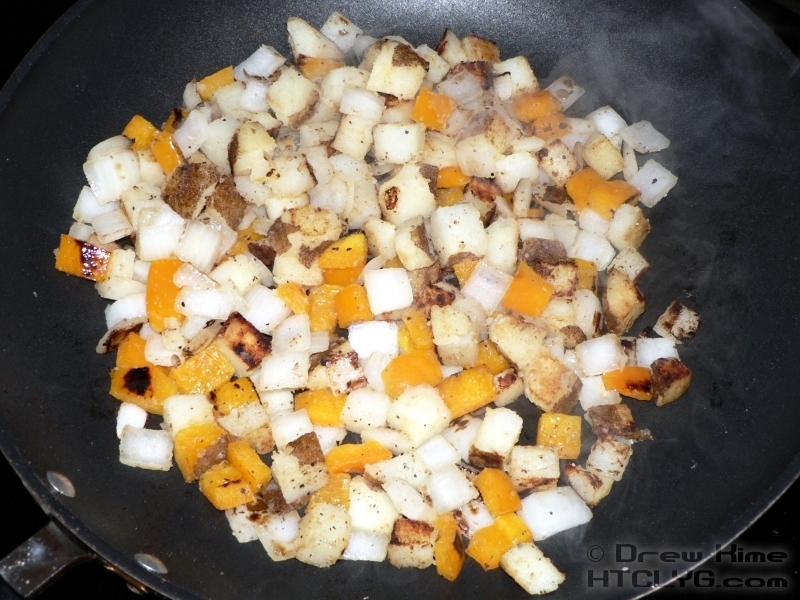 Okay, we’ve got hash browns. Now what to have with it? Oh, look at that, I’ve got that pack of hot polish style sausages. Sure, they’re usually a lunch thing, served on a bun with mustard and raw onions. But it is a sausage isn’t it? Start by dicing the potato. First slice a bit less than a half-inch thick. … and crossed the other way to make cubes. Melt a little bacon fat in a pan over medium-high heat. 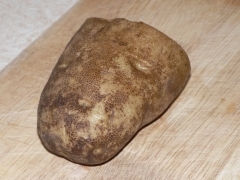 I’m using non-stick because the potato skin can really be a problem on stainless steel. 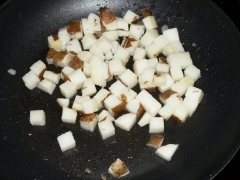 Cast iron is a little heavy to do the quick flip technique, and I don’t want to mash the potatoes up constantly mixing them with a spoon. If I were starting from a raw potato instead of one that had already been baked, the potato would have been much firmer to start, and would have needed a good 10-15 minutes in the pan before adding anything else. 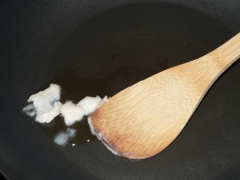 For that, I might use the cast iron. Once the fat is melted, add the potato and give it a toss to coat everything evenly. Now take one thick slice of the onion and give that a rough chop, same size as the potato. And add it on top of the potato. 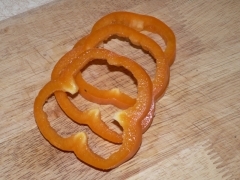 Next up is the pepper. 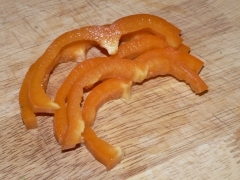 Cut a couple of rings from it. Cut them in half and flip one side over so you’ve got a bunch of long-ish pieces all facing the same direction. The other option is to cut the pepper lengthwise instead of doing crosswise rings. I prefer rings. Don’t ask why, I just do. Give them a rough chop, same size as the onion and potato. 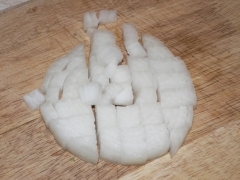 Add that to the pan. Give it a toss. 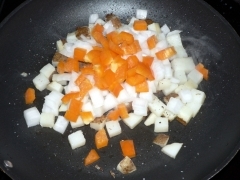 Then add salt and pepper. By this time you can see the steam starting to come out from the potatoes. 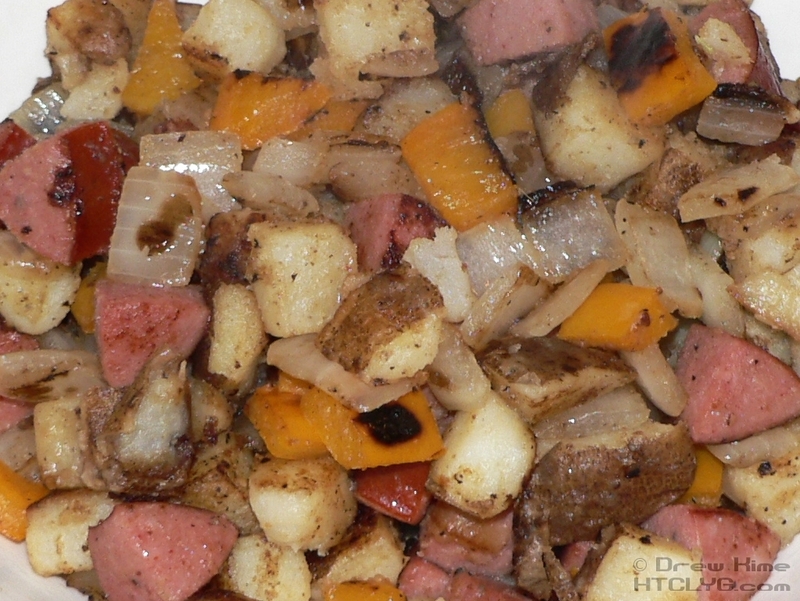 While the veggies start to cook, take the sausage and quarter it lengthwise. 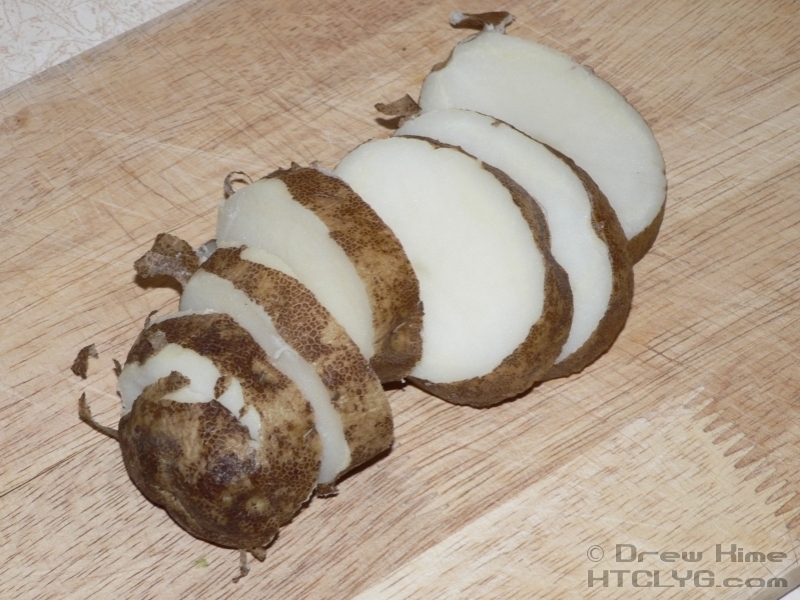 Then chop it to the same size as the potatoes. 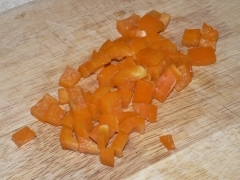 By this time the veggies should have started to get a little browned around the edges. Add the sausage to the pan, give it a quick toss to combine everything, and put a lid on. Most polish sausage is already cooked and just needs to be heated through, so at this point we just want to get it hot quickly and get a little caramelization on the edges. 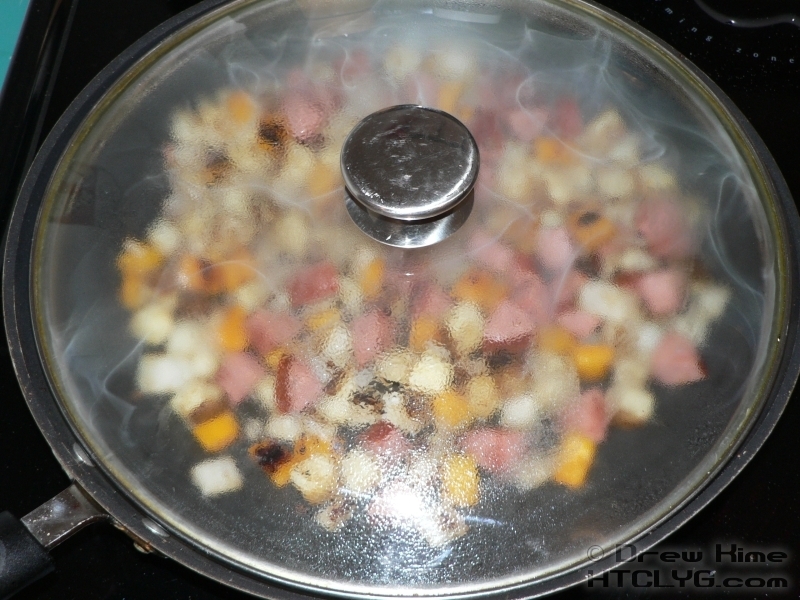 Take the lid off every 30 seconds or so and give everything a toss. 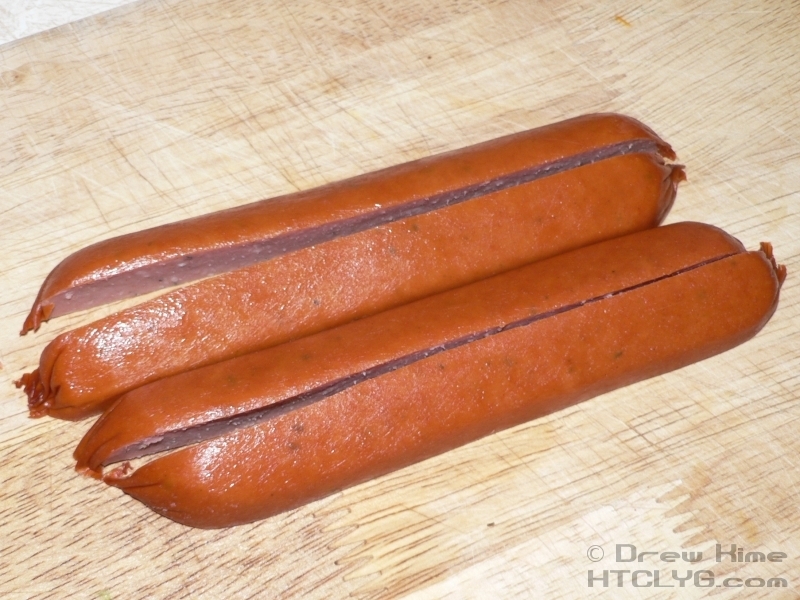 When the sausage looks good, sample one to see if it’s heated through. 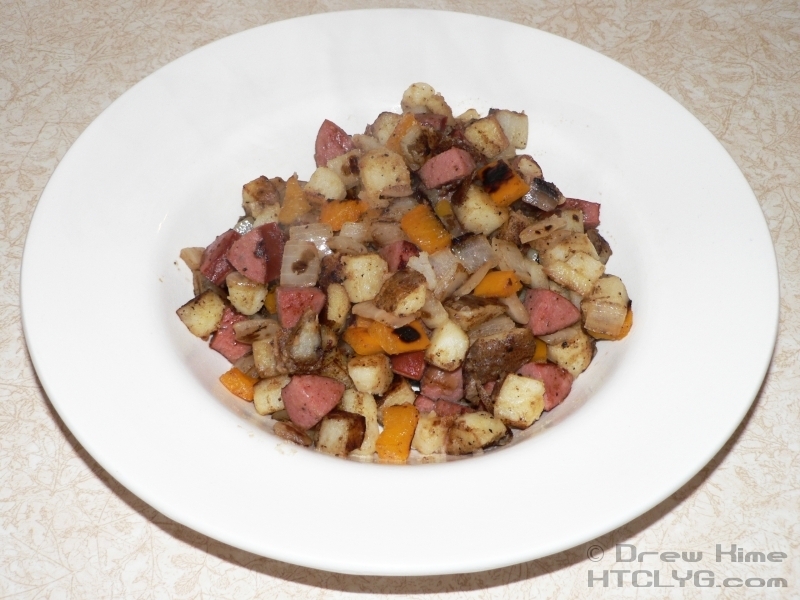 When the sausage is hot, transfer to a bowl and serve with Tobasco sauce. 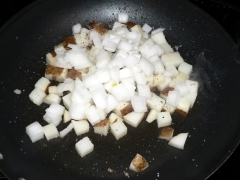 Melt the bacon fat over medium heat in a non-stick frying pan or cast iron skillet. 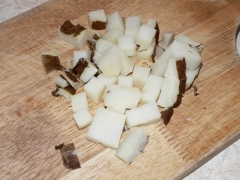 While the fat is melting, dice the potato into bite-size cubes. 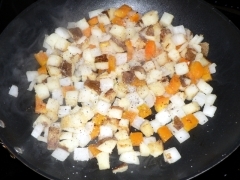 Toss the potatoes in the fat until coated. Dice the onion and pepper into the same size pieces as the potato. 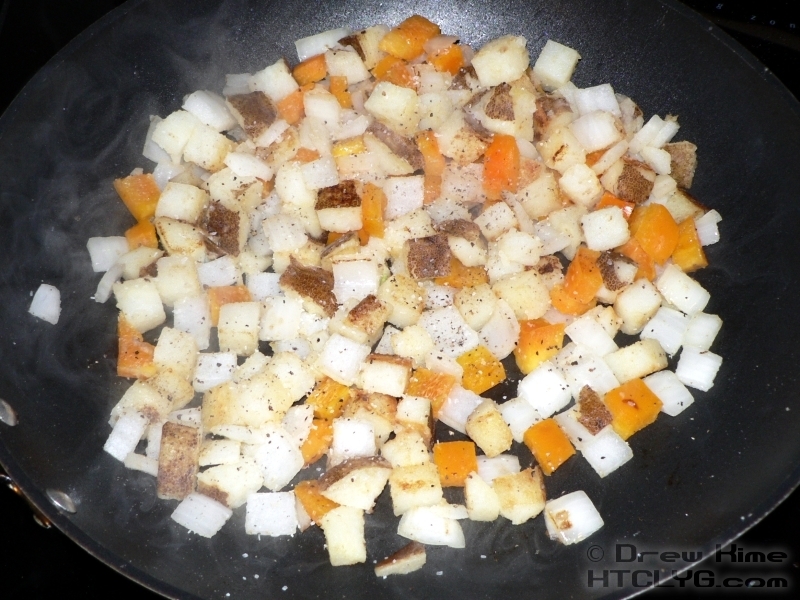 Once the potato is soft, add the onion and pepper. Toss occasionally until veggies are soft and starting to brown. 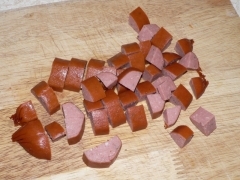 Dice the sausage into the same size pieces and add to the pan. Cover and cook until sausage is warmed through, tossing occasionally to prevent burning.